Honda Passport cargo space has been designed to fit around the needs of weekend warriors and busy parents alike – it takes the whole family during the week, then transitions into the perfect off-road machine when you need to break free. Celebrating the Honda Passport’s “spacious, high-quality interior”, the team at Edmunds.com noted that: “Adults will fit easily in any seating position.” As a 2-row version of the 3-row Honda Pilot, the Honda Passport possesses space to spare for up to 5. Total Passenger Volume: Up to 115.9 cubic feet. Headroom: Up to 40.1 inches in the front and 40.1 inches in the rear. Legroom: Up to 40.9 inches in the front and 39.6 inches in the rear. Shoulder Room: Up to 62.0 inches in the front and 61.9 inches in the rear. The Honda Passport fits a One-Touch Fold-Down 60/40 split rear seatback as standard, so you can flip down all or part of the rear row for added cargo space. Cargo Volume Behind the 2nd Row: Up to 50.5 cubic feet. Cargo Volume Behind the 1st Row: Up to 100.7 cubic feet. Cargo Area Light: Provides clear illumination across the cargo area to help keep things organized. Cargo Area Underfloor Storage Compartments: Underfloor cargo compartments provide added convenience and security. Four Cargo Area Tie-Down Anchors: When you need to carry larger or heavier items, stop them sliding around as you drive by securing them with four tie-down anchors. Cargo Area Bag Hooks: Hang your grocery bags to ensure their contents don’t spill as you go through corners. 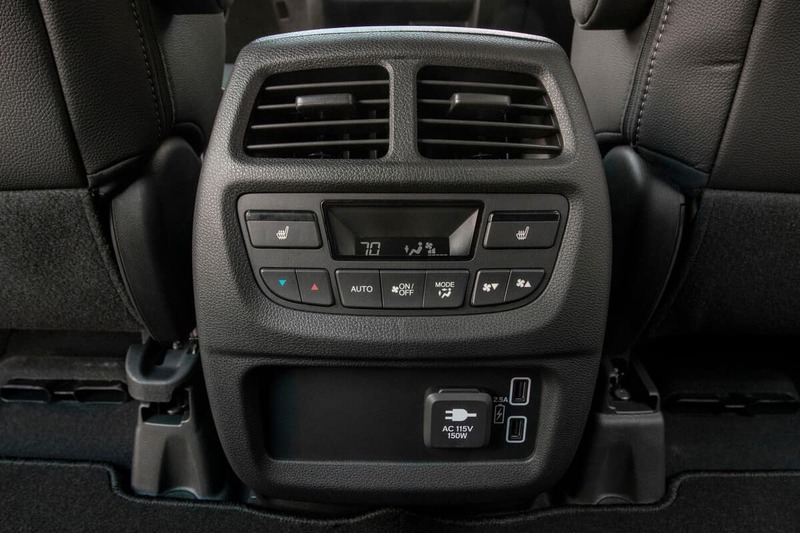 Cargo Bins: Inserted into the wheel well behind the rear seats, two cargo bins offer a 77-lb maximum load capacity. Cargo Cover: Keeps items out of view and protected from UV rays. Cargo Net: Tight elastic cord construction keeps bags upright and loose items secure. Cargo Organizer: Sturdy canvas dividers help organize and secure your cargo. 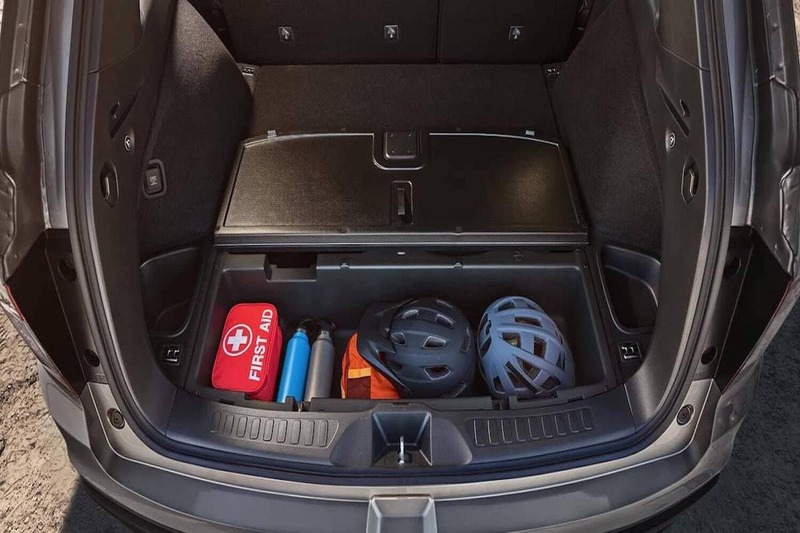 Cargo Tray: Protects the rear storage area floor from accidental spills and scrapes. Cargo Side Panel Protectors: Safeguards the sides of your original cargo area with quality molded thermoplastic. Cross Bars: When you run out of room, cross bars let you take more up top. Bike Attachment – Frame Mount & Fork Mount: Carry two bikes at once on fast loading, high security mechanisms. Kayak Attachment: Use soft, adjustable saddles to firmly cradle a kayak. Roof Basket: With a low profile for minimal wind resistance, the roof basket holds up to 150 lbs. Roof Box – Mid-Size & Short: Enjoy up to 13 or 16 cubic feet of enclosed and lockable storage. Ski/Snowboard Attachment: Hold six pairs of skis or four snowboards securely in place. Surf/Paddleboard Attachment: Create a custom fit for boards up to 34 inches wide. You can hold up to two at once. Tent: Sleep 6 in a 10 ft by 10 ft tent that opens out from the cargo area and provides full access to the vehicle. Combining capable Honda AWD performance with a spacious and versatile interior, the new Honda Passport deserves a test drive. To find out more or explore the latest special offers, simply contact us today or pay a visit to your local Central Illinois Honda dealer.